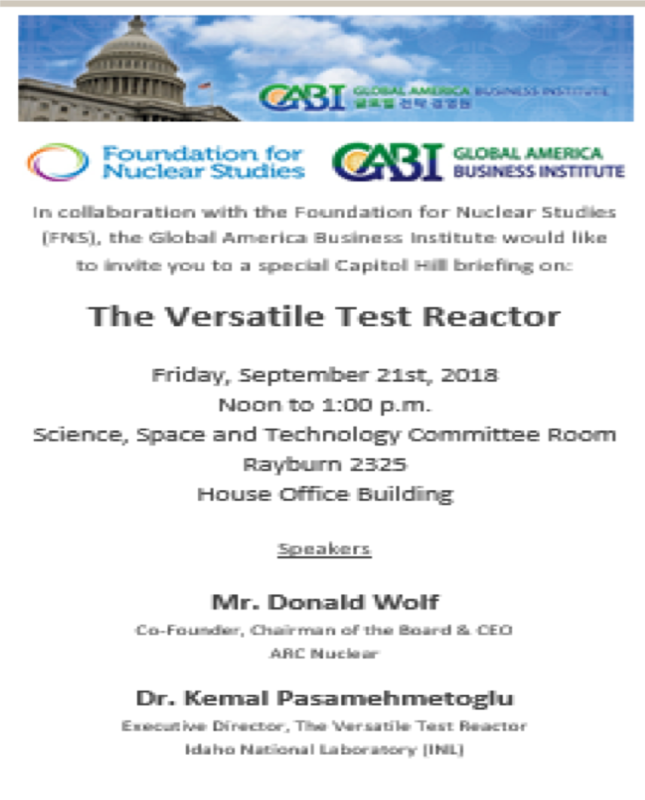 WASHINGTON, D.C.– Don Wolf, Chairman and CEO of Advanced Reactor Concepts LLC (ARC), represented the company at a presentation introducing a US Government program to fund development of a “Versatile Test Reactor.” The presentation was held September 21, 2018 in the Rayburn House Office Building, House Science, Space & Technology Committee Room of the US House of Representatives. The Versatile Test Reactor (VTR) to be built at Idaho National Laboratory will create a test facility that will have the capability to subject proposed nuclear fuels and other components to testing inside an operational nuclear reactor. The VTR as proposed is based on the same technology (sodium cooling) as the ARC-100 reactor, and ARC was in part asked to speak at this event to describe its technology and to describe how the VTR could be used to advance the development of the ARC-100. Mr. Wolf participated in a panel entitled “An Overview on the Versatile Test Reactor.” His presentation was entitled “VTR: Essential for Our Strategic Nuclear Leadership”. He was joined on the panel by Dr. Kemal Pasamehmetoglu, Executive Director, Versatile Test Reactor Program, Idaho National Laboratory.